The Iranian leader also sought assurances from the three European signatories of the deal that they would not raise the issue of Iran’s ballistic missile program and regional policies – two key requirements set by the Trump Administration for a new deal with Tehran. He stressed that Iran will not curb its missile activities and will not change its regional posture, describing presence and influence in regional countries as a key pillar of Iran’s power and deterrence strategy. “No logical government will give up this pillar of power,” he added. “The aim of nuclear negotiations was to remove the sanctions, most of which were not lifted. 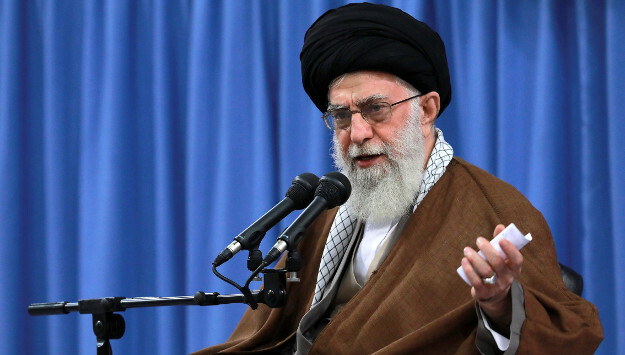 In addition to making threats lately, they are reinstating the sanctions despite a United Nations resolution,” Khamenei continued, also calling on Europe to condemn the U.S. unilateral exit through a resolution at the UN Security Council. Comment: Khamenei’s remarks appeared to be a response to U.S. Secretary of State Mike Pompeo’s speech at the Heritage Foundation on Monday, in which the top American diplomat listed 12 requirements for a new deal with Tehran. Pompeo called on Iran to end its support for militant and terrorist groups across the region, halt development and proliferation of ballistic missiles, cease most nuclear enrichment activities permanently, allow a more robust inspection of Iran’s nuclear a military sites, release all Americans jailed in Iran, and improve the human rights situation in the country. Khamenei and other Iranian leaders have rejected all these demands. Khamenei also wanted to put pressure on Europe to accommodate Iran’s conditions, by signaling that Tehran would otherwise leave the deal and resume high-level enrichment. Iranian leaders understand that U.S. sanctions would deter most, if not all, major international banks and companies to do business with Tehran; therefore, they are seeking assurances that European companies continue to purchase Iranian oil and invest in the country. As Khamenei pointed out, several European companies, such as French oil giant Total, announced after the U.S. withdrawal from the nuclear accord that they would halt their activities in Iran unless they receive sanctions waivers from Washington. Tehran also does not want ongoing talks with Europe to extend to the missile issue or Iran’s regional role. European leaders share Washington’s concern about the two issues, but they want to address them separately from the nuclear deal. For now, Khamenei has permitted the Rouhani government to pursue talks with Europeans as well as with China and Russia to secure Iran’s demands and keep the deal alive. But it is far from certain the Europeans can meet Tehran’s demands even if they intend to do so. In Europe, governments do not decide for private companies; and most European major companies are unlikely to jeopardize their large stakes in the American market and risk U.S. sanctions by seeking business deals in much smaller Iranian market. It is also unclear if European countries can find alternative financial ways of continuing business with Iran to the extent that would satisfy Iran to remain compliant with the nuclear accord despite the U.S. withdrawal. The increasing U.S. pressure is also set to intensify infighting between the Rouhani government and its hardline critics. The Revolutionary Guards, in particular, will try to weaken the Rouhani government and further tighten its grip of Iran’s politics, security and economy. As Khamenei insisted on the need for “resistance economy” to enhance domestic capacities instead of relying on foreign companies, the Guards will be the first to step in to fill the void.